The New Britain Bees were supposed to enter their inaugural season at New Britain Stadium with strong competition from the Hartford Yard Goats, located 13 miles away at a new, $56 million state-of-the-art minor league baseball stadium just north of downtown Hartford. But then fate smiled on the Bees in the form of construction delays that ultimately shuttered Hartford's Double-A ballpark without a single pitch being thrown. While the Yard Goats have played a hopscotch schedule of home games in various away stadiums, the Bees have hunkered down in the Hardware City, building their base of fans and corporate support. Pat Day, the Bees' general manager, said the Yard Goats' misfortunes have given him time to build the team's brand. There's no competition for home ticket sales or the fan experience the Yard Goats stadium was hoping to offer in terms of new electronics and food and beer from local restaurants. The Bees still play in front of the old scoreboard and the stadium cuisine, while reasonably priced, is not distinctive. "We're building something fun here that sponsors and employees can be proud of. We couldn't be happier with how the market has responded," Day said during an interview at his office along the first-base side at New Britain Stadium. Day, who has spent 19 years in professional baseball, including almost nine years as a GM, said his immediate focus when he was hired in Nov. 2015 was building an expansion team from the ground up. The New Britain Bees joined the independent Atlantic League after a Camden, N.J., team folded. Day was starting from scratch because the New Britain Rock Cats moved to Hartford taking all their staff and records. He had to recruit a new front-office team tasked with quickly getting up to speed on things like season-ticket sales and corporate sponsorships. The latter was made somewhat easier by Stanley Black & Decker agreeing to stick with its hometown team as a lead sponsor. Other sponsorships are a mixture of trade and cash, Day said, from a wide range of organizations including a local insurance agency, the Community Foundation of New Britain, and even a bowling alley, among others. Day declined to disclose sponsorship revenues. "We're happy with what we are seeing. We had to put together an organization in 75 days," Day said. "The opportunities for sponsorships are endless. We don't ever run out of inventory. That's the beauty of minor league baseball." Day said a minor league team's success isn't measured by wins and losses (the Bees were 37-36 as of July 7). Most fans go for the family experience and foodstuffs. "At the end of the day, success is measured through corporate support and ticket sales," he said. On the attendance front, Day said he's been happy with the numbers, but the Bees are attracting fewer fans per game than the Rock Cats did. Through its first 32 home games, according to league statistics, the team drew 95,528 fans to New Britain, averaging 2,985 a game. That puts it in seventh place for average attendance among the eight teams in the league. The Rock Cats drew 267,377 fans to New Britain Stadium in their final season, which included 66 home games, averaging 4,051 fans per game. At its peak in 2010, the team averaged 5,190 fans per game. "We certainly have to grow our business. We ask everybody for their business," Day said. Despite slower ticket sales, Day predicts the team will turn a profit in its first season. It's being helped in part by the lease it worked out with the city of New Britain. The team has a 15-year compact, renewable every five years. Its rent is $150,000 per season for the next five years, similar to what the Rock Cats paid, and then it goes up to $160,000 in 2021. There's one significant difference: The Bees get to keep the parking revenue; before that money used to go to the city. New Britain Mayor Erin Stewart said the parking program used to be run through the city's parks and recreation department, serving as a de-facto summer jobs program for city youth. "If we had $20,000 left over at the end of the summer we were lucky," the mayor said. Those funds were more important to the team. "You have to get creative about how to sweeten the pot," the mayor added. The city also invested $500,000 in the stadium, including facade work, a new Fun Zone with a climbing wall, and an interior paint job that represents the new tenant's black and yellow colors. "The amount we had to put into the field was nothing compared to the paint job," Stewart said. The mayor said there is a benefit to the stadium that can't be instantly quantified. "We don't make any money off the stadium," Stewart said, adding it's a case of breaking even. The city pays for maintenance and debt service and staffers taking care of the field. 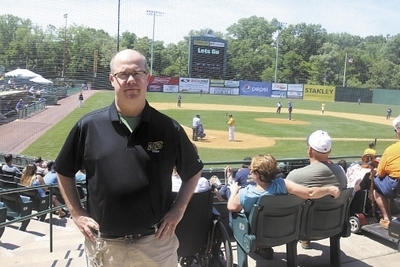 In terms of economic value, the team and stadium are an economic driver because they attract people who spend money in New Britain, Stewart said, adding that it would be a blow to the Hardware City's tourism to not have a team because the city is known as a baseball destination. Day said that strong baseball affinity was one of the reasons the owners decided to invest in the team — that and the mayor herself. The Bees are owned by Frank Boulton, a founder of the Atlantic League and owner of several teams. "The mayor did a fantastic job getting the team. It's always important to have a city behind you," Day said. Stewart is pretty frank in what she learned about the process of getting a team. In addition to the Atlantic League, she dealt with reps from the Canadian-American Baseball League and the Futures League. She described baseball as being similar to politics. "It's a cutthroat business," she said, adding there can be shady, backroom deals. "I'm happy we went with a league with high morals and ethics. They run a solid business," she said.